Quite a few reviews have been written for Peter Masters' article, "The Merger of Calvinism with Worldlinessm"and mainly negative. If you are involved in ecclesiastical punditry, never ever let a fat pitch go by. The assumption is that Wilson has taken Masters' article and hit a home-run. Masters lobbed an easy one to Wilson, so he need only argue with half his brain tied behind his back. I'm sure this is the "serrated edge" that Wilson claims to wield. Let's see what he can do with Masters' soft ball. Masters . . . rejects some of the doily arrangements on the davenport of old school pietism. So to speak. [H]is (Masters') definition of worldliness is more indebted to the residue of Victorianism. [People like Masters] sprinkle their daytimers with weekly wine and cheese events in support of the local symphony and/or arts councils. [Y]ou also have ask the same question about Liszt and Chopin, not to mention other composers of other pieces that sweet homeschool girls play at their piano recitals. Wilson mounts a preemptive defense of this line of mockery with an explanation of what a bad thing Masters has done in implying that MacArthur and Piper "don't have the love of the Father in them." I didn't read this implication in Masters' piece but Wilson applied the special juice for reading between the lines. I wonder if one can purchase the juice at Canon Press. Wilson's main problem with Masters' review is his "appeal to certain sectarian traditions as though they were the emerald glow around the throne of God." Nowhere does Masters appeal to sectarian traditions. Pass the cracker-jacks as we wonder when Wilson might waddle to the plate. While working on this post, to take a snippet of my playlist at random, I have listened to "Feelin' Alright" by Joe Cocker, "Rivers of Babylon" by the Melodians, "96 Tears" by ? and the Mysterians, "Lonestar" by Norah Jones, "Almost Hear You Sigh" by the Stones, "Watching the River Flow" by Dylan, "Motherless Child" by Clapton, and you get the picture. Now here is a quick quiz. Get out your Bibles, everybody. Is that playlist worldly? Wilson says he understands "what kind of music is suitable" for a worship service. Based on his standard of exegesis for his musical playlist, how does he know what music is suitable? Where does the Bible list the music suitable for worship? I've got a simple solution for Wilson: use the same "understanding" that you have for "suitable worship music" to determine whether your playlist is worldly. Wilson wants to have it both ways. He can judge his worship service music with an understanding that he has, but no one can judge his musical playlist because those songs aren't specifically listed anywhere in scripture. Masters must have had some movement on that fat pitch because I felt a breeze coming from Wilson's bat. The other genius reason that Wilson says we don't use rock music for a worship service is because "ours (sic) forms of it are almost always lousy rock music." Aaaaah. Yes. If we just knew how to do "good" rock music, then it would be acceptable---I guess good like Dylan, Clapton, and the Stones. Every good classical piano player I've ever asked says that rock music isn't hard for him to play. Maybe our Christian rock isn't violent, syncopated, or sexual enough. Most of Wilson's essay just assumes that Masters doesn't have the special knowledge, cultural education, and maturity that Wilson possesses in discerning what is worldly music. Before agreeing with Masters that young Calvinists shouldn't go clubbing, Wilson takes his last big whiff. Masters writes that Christians need "the personal guidance of God in the major decisions" or else strike "a death blow to whole hearted consecration." Wilson spins this into making "personal life-decisions as though the gift of prophecy were still operative today." How did "personal guidance" become extra-scriptural revelation? That's not what I got out of Masters' statement. What I read in Masters' sentence, and perhaps he was not clear enough at this point, was that God can guide believers in the application of Scripture. Application of the Bible doesn't require extra-scriptural revelation. Consecration to God requires applying Scripture. The Bible doesn't tell us the name of the person we're going to marry or what the titles of the songs are on our playlist, but it gives us the principles and we rely on the Holy Spirit ("personal guidance of God") to live a consecrated life. I concur with Wilson's last statement---"It is not that difficult." Unfortunately, Wilson has taken tee-ball and made it look like Nolan Ryan. Frank Turk, the Centurion, chimed in the discussion. Many might have a hard time believing that I essentially agree with Frank through his entire post until he gets to his eleventh paragraph. I don't know if that will make him happy. I would tweak the first ten paragraphs here and there, but it is this statement about Masters that brings Turk and myself into conflict. [H]e honors and confesses a proto-fundamentalist view of all things, down to making even matters of style and context into urgent doctrinal crises and therefore matters over which to separate. It isn't as simple as this for Masters. For him, like myself, this is a worship issue. He wants God to be recognized, believed, and worshiped. When evangelicalism offers a worship that so contradicts the character and nature of God, men will be deceived as to who God is and what He desires in worship. That is about all I differed from Frank. As disappointing and largely wrongheaded as Masters' rant is (basically he dismisses "new Calvinists" because he doesn't like their music style and their worship style), I am afraid he is at least somewhat in Spurgeon's tradition. I can applaud the honesty of Phillips. He agrees that Masters takes the same position as Spurgeon on this, so that he rejects what both of them say. Later he says that Spurgeon should not have condemned theater-going---this, of course, coming from a Phillips who is a regular theater attender and who writes reviews on his blog for many of the movies he has seen. His other problem with was the statement about "personal guidance" that Wilson referred to. I think that Phillips read Wilson and then interpreted Masters in light of reading Wilson. I think they are both wrong about what they are rather reading into what Masters believes and teaches. The pretty much renders moot most of the second half of his post. 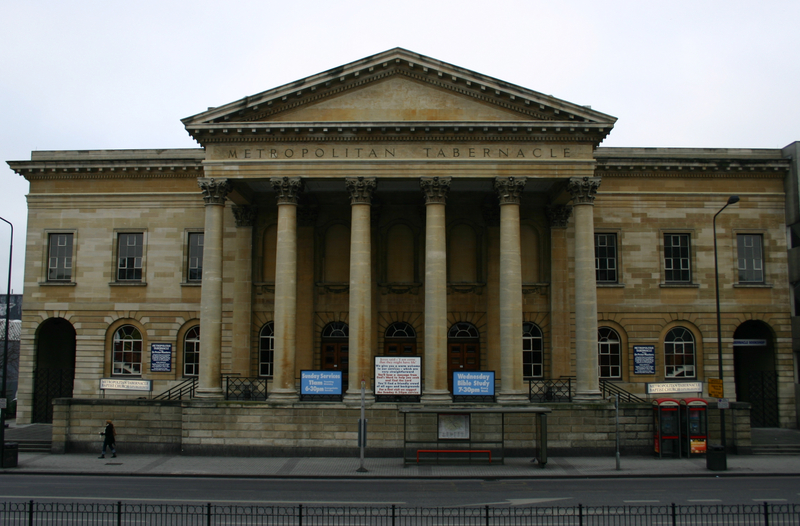 One of the most famous churches in the world is the Metropolitan Tabernacle in London, England, where for thirty-eight years (1854-1892) Charles Haddon Spurgeon pastored and preached. By the time we get to the late 1960s, the church had shrunk down to a tiny membership. Then Peter Masters became its pastor in 1970 and, despite horrible moral, spiritual, and religious conditions in England, the church has experienced a renaissance of numerical growth with a comparable belief and practice to Spurgeon himself. Masters, like Spurgeon, is a Calvinist, and one in the Spurgeon tradition. He and his church are aggressively evangelistic while remaining God centered. They have expanded from preaching the gospel, notwithstanding a strong position against many of the unscriptural modern church growth innovations. Masters has written many books and essays, including Worship in the Melting Pot. Less than a month ago, he wrote an article entitled, "The Merger of Calvinism with Worldliness," a quasi book review of Young, Restless, Reformed, by Collin Hansen. His analysis became more a jumping off point for him to warn of false worship within "new Calvinism." Many well-known, online blogs have responded to Masters' piece, very little positive. This post will support and explain what Masters has written, as well as expose the negative reviews he has received. Indeed, a far better quality Calvinism still flourishes in very many churches, where souls are won and lives sanctified, and where Truth and practice are both under the rule of Scripture. Such churches have no sympathy at all with reporter Collin Hansen’s worldly-worship variety, who seek to build churches using exactly the same entertainment methods as most charismatics and the Arminian Calvary Chapel movement. . . . The new Calvinists constantly extol the Puritans, but they do not want to worship or live as they did. He warns about worldly, syncretistic worship utilized as church growth methodology and reflecting continuationist charismaticism. He sees Calvinism as the adhesive employed for keeping together the various and contradictory points of view. He evaluates this as an erroneous separation of soteriology from sanctification, yielding a conduct incongruent with God's sovereignty. Most of the reviews of Masters decried his lack of scriptural exposition. Masters was editorializing. It took on the form of a scriptural exhortation. He didn't refer to specific passages, but he did use biblical, doctrinal truths as a basis of his criticism. He's also exegeted the passages in previous books he's written that stand as a basis for what he says here. He has a reason to be upset. He sees false worship as very bad. Everyone else should too. The new Calvinists target the gospel as the minimum objective of fellowship. They get together to revel in the gospel with too much emphasis on reveling. The gospel has become another commodity to consume. They've been saved with the accent on they. They're lovin' their salvation. The gospel will end in worship, but worship for them has become more about how they feel than what God wants, compatible with the spirit of the age. The current of consumerism flows strong in the United States. The customer wants the best deal for himself. He chooses by what makes him feel the best. What is to make this so special to God is that He gets something that worshipers feel so good about. The points of Calvinism are not alone enough to stir the new Calvinists' affections above the level of indifference. Instead adoration must be propelled along by the histrionics of the musical composition. They reason that something living must be felt. The music causes a feeling so it must be alive and, therefore, is authentic. The theological content of the words justifies the feeling. Physiological manifestations validate spiritual reality like is seen in the charismatic movement. They are feelings choreographed by musicians with the credit going to the Holy Spirit. If not produced by the music, they are faked according to the importance of facial expressions to the communication of authenticity. Grimacing, eyes closed, hands waving, and heads wagging are all stock reactions in the catalog of sincerity. And yet the Holy Spirit hasn't worked through music not characteristic of His work. And these aren't responses anywhere in scripture that authenticate spiritual reality. Within the five points Christ is to be glorified by Calvinism. Jesus chose, atoned, supplied grace, and secured. Instead of the Lord being raised high above and separate from what is common and profane, He is dragged along by the musical choices of professing adherents. Jesus has become an icon to them. They use Him as an excuse to celebrate. The party is fun and Jesus is a good reason to have it. It's so much fun that it must be real, so He must be pleased. And on top of that, 'Jesus' logo is imprinted on my teeshirt with matching grafiti font.' Hardly anything is more heart-felt than grafiti, the crumbling brick walls of a third world infrastructure, and a Mao Cap with a "resolved" symbol in place of the red star. The most recent spiritual, historical patriarch of new Calvinism is the Jesus movement of the late 1960s and early 1970s. These evangelicals often mention fundamentalism's infatuation with the 1950s. Most evangelicals, whether they know it or not, love the 60s and 70s. The Jesus movement invented the new measures for new Calvinism revivalism. Masters makes reference to this when he mentions the "Arminian Calvary Chapel Movement" as well as Francis Schaeffer's sixties sit-in style of biblical dialogue that mirrored what college students were doing on the campuses at the time. Schaeffer's method could easily be the forefather of today's online forum where everyone with an opinion counts as much as anyone elses. Some of the important new measures the Jesus movement introduced into evangelicalism are worldly music, very casual dress, new hip styles of communication, casual relationships between boys and girls outside parental authority, and cutting edge marketing. All of these provided a comfortable and accepting environment for that generation of young people. We see the same new measuresas the Jesus movement (except worse) in the new Calvinism with Piper, Macarthur, Mahaney, and Driscoll. The reason these new measures work is because these young people are immersed in the world as a Christian liberty. The measures speak their langugae, a worldly one, and makes the religion an acceptable one to them. There really isn't that much different, probably only a little in degree, between the new measures of new Calvinism and the methods of Rick Warren and the seeker sensitive. It is obvious that this new missiology and contextualization are appealing to a demographic. The content has more substance in the new Calvinism, but the methods are often the same. The joy in Jesus Christ and the teaching of scripture isn't enough. It must be embellished with the enoucrements of the natural man. The points of Calvin start with total depravity. The new Calvinism parks on the inability of depravity, so that when Christ chooses, ability is what they've received. They were unable and now they're able. They seem to forget that depravity was alleviated as well. Enabling grace limits the power of unredeemed flesh. Its power no longer has dominion. Children of darkness become children of light. That separation is blurred by the revivalistic new measures of new Calvinism. The new Calvinism lacks the distinction between the sacred and the profane. Indeed, they are jumbled together in a way that you can't tell where one stops and the other ends. Recently John MacArthur has become incensed with the smutty language used in the preaching of Mark Driscoll, and rightly so. However, he doesn't seem to have the discernment to see how that the new revivalistic measures his church employs have profaned the holy name and character of Christ by framing Him within the common fashions of smutty culture. In contrast to Finney revivalism, some serious exposition in the conferences and gatherings supposedly justifies the new measures of new Calvinism. Many of the various video clips of preaching used to advertise this preaching attract using worldly means. The clips themselves accentuate the theatrics one would experience if he chose to attend. The exposition in these meetings does enlighten in doctrine, but often without the specific and strong application that would give pause to a seeker more interested in the fun time. "Immoral Drug-induced Musical forms of Worldly Culture"
While working on this post, to take a snippet of my playlist at random, I have listened to "Feelin' Alright" by Joe Cocker, "Rivers of Babylon" by the Melodians, "96 Tears" by ? and the Mysterians, "Lonestar" by Norah Jones, "Almost Hear You Sigh" by the Stones, "Watching the River Flow" by Dylan, "Motherless Child" by Clapton, and you get the picture. I suppose that this is what the grace of God means to Douglas Wilson. One of the vaunted new conferences is called Resolved, after Jonathan Edwards’ famous youthful Resolutions (seventy searching undertakings). But the culture of this conference would unquestionably have met with the outright condemnation of that great theologian. I believe that Masters could safely say these two sentences in the light of Edwards' book Treatise on the Religious Affections. This conference violates the major theme of Religious Affections that Edwards unpacked from scripture. What shapes the modern world is not powerful minds, but powerful forces, not philosophy but urbanization, capitalism, and technology. As the older quest for truth has collapsed, intellectual life had increasingly become little more than a lgoss on the process of modernization. . . . Christian faith, which has made many easy alliances with modern culture in the past few decades, is also living a fool's paradise, comforting itself about all of the things that God is doing in society (which is the most commonly heard religious version of this idea of progress) while it is losing its character, if not its soul. Today we "demand instant access to authentic reality, " he [author Brian Wilson] says, and these ministries do indeed offer instant and painless access, the authenticity of which is "guaranteed by subjective feeling, reinforced by group-engendered emotions"; the televangelists capitalize on the widespread perception that "reality is to be felt rather than cognitively realized." The growth in this type of evangelical faith in America is in part also to be explained by the powerful undercurrents of self-absorption that course through the modern psyche. Many charismatics have made the experience of God rather than the truth of God foundational. The self therefore becomes pivotal. This, in turn, links with the deep subterranean sense of progress that is inescapable in America, as the proponents of this movement tout it as the most recent cresting of the Spirit. When you look at their ‘favourite films’, and ‘favourite music’ you find them unashamedly naming the leading groups, tracks and entertainment of debased culture, and it is clear that the world is still in their hearts. The new Calvinists talk about worldliness being only a matter of the heart. Even if it were just in one's heart, it will come out in the life and Masters is right to point out that this is how it is seen. The new Calvinists talk about their favorite lager, the latest blockbuster, and the music of their most beloved rock group. This displays the world in their hearts. The new Calvinism is not a resurgence but an entirely novel formula which strips the doctrine of its historic practice, and unites it with the world. The old Calvinists like Spurgeon, Gill, Owen, and Turretin, among many others had much to say against worldliness. And they did in a day when there was so much less to be attracted by in the world. You can't appreciate their soteriology with appreciating their seperation from the world. When you read those old Calvinists, you see that their sanctification arose out of their soteriology. You couldn't divide the two with them. The new Calvinists have separated them anyway. A final sad spectacle reported with enthusiasm in the book is the Together for the Gospel conference, running from 2006. A more adult affair convened by respected Calvinists, this nevertheless brings together cessationists and non-cessationists, traditional and contemporary worship exponents, and while maintaining sound preaching, it conditions all who attend to relax on these controversial matters, and learn to accept every point of view. In other words, the ministry of warning is killed off, so that every -error of the new scene may race ahead unchecked. The kind of pluralism that is necessary to eliminate antagonisms among the competing views has the effect of reducing the values of each inhabitant to the lowest common denominator. City life requires the kind of friendliness that allows us to cohabit with the mass ethic. It is typically assumed that this sort of friendliness must be divested of moral and religious judgment, since it is difficult for our society to see how judgments about truth and morals can escape the charge of social bigotry. And so we settle for the kind of friendliness within which all absolutes perish either for lack of interest or because of the demands of social etiquette. It doesn't seem that Masters is willing to settle for that "friendliness." I know I won't. The new Calvinists do. (to be continued) I will deal with several of the negative reviews that Masters has received. A few days ago, I received a nasty comment here from 'anonymous,' and he started it with some sarcasm about my majoring on the minors. Don't look for the comment. I didn't post it. It was error-filled, so I wasn't interested in anyone entertaining its content, especially since he wouldn't own it. But it did motivate me to speak to the concept of "majoring." I've found the criticism, "you major on the minors," to be common. Rather than dealing with the actual exegesis or application, the critic attacks the choice of subject matter. It is akin to a poor review of a book on Gettysburg because the author didn't choose Antietam. I refuse to accept the 'majoring on minors' charge. The Bible chronicles the technical character of God. He wants minutiae kept. I believe we invented "minors" for fake unity or to excuse some kind of disobedience. A violation is minor to the ones who want to do it. Our concern should be whether God is pleased or not. Cain thought fruits and vegetables were minor. Nadab and Abihu thought their unique recipe for the altar of incense was minor. Achan thought the Babylonian garment was minor. Uzzah thought touching the ark was minor. David thought the means of carrying the ark was minor. Moses thought that striking the rock was minor. Ananias and Saphhira thought that holding back part of their offering was minor. Israel thought that using Gideon's ephod for worship was minor and that worshiping God in the high places was minor. We can see the presumptuousness comes from a disrespect of authority. The presumptuous takes liberty where he doesn't have it. He assumes too much. He takes matters into his own hands, presuming that it shouldn't matter as much as other issues, because it isn't as important. And yet, if God said it, it's important. He possesses all authority. If He said it, He meant it, and He expects us to obey it. If we love Him, we will keep what He said, and it won't be burdensome to us to do so (1 John 5:3). The "minor" that my critic disapproved was the obedience of Deuteronomy 22:5. Deuteronomy 22:5 ends by saying that all who violate one of its prohibitions "are abomination unto the LORD thy God." My critic is saying that an abomination to God is a minor issue. How could anyone who loves God think that becoming "an abomination to God" is permissible, only a minor issue? John writes in Revelation 21:8 that "the abominable . . . . shall have their part in the lake which burneth with fire and brimstone: which is the second death." You can see how presumptuous they are who say that disobedience to Deuteronomy 22:5 is a minor issue. KB: "On the pants/skirt, I don't think the position gets explained exegetically and historically well enough, but your position will fail exegetically and historically"
A few weeks ago on the former fundies blog, I demonstrated that your argument for this is not exegetical, it's circular. I'm not going to get into it here, but your argument for "the male article" is strictly a cultural determination and not a biblical one, yet you say that the culture used to hold to a biblical standard which can't be found anywhere in the Bible concerning the definite male article. As you can see, he pulled a quote from my comment (I'm "KB") and then addressed it. I want to deal with this idea that my position on designed gender distinction is not exegetical. Of course I believe he's wrong. I think it does show a blind spot in how to exegete and then apply scripture that is common in many evangelicals and fundamentalists. Major Premise: Corrupt communication is disobedience to God's Word, that is, sin. Minor Premise: #&$%@*# is corrupt communication. Conclusion: Therefore, #&$%@*# is disobedience to God's Word, that is, sin. Paul did not tell us what corrupt communication was. When he wrote that passage in the first century, the English language didn't exist. So we must apply this passage culturally. We would assume that there is English language that is corrupt communication. If we cannot make that assumption, then we cannot apply this passage and it is meaningless to us. We know that is not the case. I'm going to guess that Will thinks that there are English words that Paul would be referring to "in principle" in this verse, words that we should be expected by the verse to refrain from communicating. Does Will disregard it because of a "cultural determination?" I doubt it. Does he dismiss the verse because it is a "circular argument?" Again, I strongly doubt it. So that's what makes his little diatribe a totally moot point. Minor Premise: Pants or trousers are a designated male-only article. Conclusion: A woman who wears pants or trousers is an abomination to God. I'm dealing only with Will's criticism, the so-called cultural one. (I want to limit the comment section to discussion only about this particular point, so I won't publish comments that are off this narrow aspect.) Quite a few verses in the Bible require application within a culture. That doesn't make the interpretation of those verses less exegetical. We've got to apply scripture within our culture. That doesn't take away from the meaning or the authority of the Bible in those issues. What About Culture on Designed Gender Distinction? The position that the culture determines what are the male-only and female-only articles of clothing is the historic position. You'll see it word for word in seventeenth century Puritan Vincent Alsop's "The Sinfulness of Strange Apparel." Women don't have on the male garment and men don't wear the female articles of clothing. Even though culture makes the application, the purpose of this prohibition in Deuteronomy 22:5 relates to God's created design as seen in Genesis 1:26-27. There we see God created man in His image, male and female He created them. The image of God is seen in both male and female. The distinctions between the two make up the image of God in man. This is how God's image is represented by man, by distinctions between male and female. Every culture and people are responsible to keep Deuteronomy 22:5. You can see this in the words "all that do." In every instance these words are found together (in the Hebrew too), they refer to all of mankind, any nation or people. This one grammatical point says that this wasn't only an Israelite regulation. In 1 Corinthians 11:3-16 Paul expects the Corinthians to keep a culturally designed distinction between male and female with the head-covering. We can see in Isaiah 47:2-3 that the absence of a head-covering for Babylonian women ("uncovered locks") was a shame unto them. In 1 Corinthians 11, not having the head-covering was a shame to a Corinthian like the shorn or shaved head was significant of a prostitute. This is obviously a culturally related issue, because in our culture, the shaved female head does not portray a prostitute. It did in Corinth. This criticism usually centers on the dress that was worn by men and women when Israel received this law. Most say that men and women both wore robes. Perhaps they did. The Bible doesn't say. What is ironic about this criticism is that the Bible doesn't tell us what the male or female garments were. For the sake of dealing with this criticism, however, let's say that there was a male robe and a female robe. I think there were. The point of Deuteronomy 22:5 was that there the robes were designed differently. How were they different? There may have been colors that must be kept different, ornamentation that must remain peculiar to each robe, perhaps the actual type of material, the girdle, the sleeve length, and more. We don't know what those distinctions were. The point of Deuteronomy 22:5 is that they were designed distinct, not sameness. For centuries in our culture, the unique male garment, which was public and constant, for the purpose of distinction, was the pants or trousers. The woman distinguished herself from the man with the skirt or dress. When women began wearing pants or trousers, the distinction was not replaced, but removed. Women began wearing pants at the expense of the distinction, not for distinction. For arguments sake, let's say that now both men and women both wore pants, like we are saying that in Old Testament Israel, they both wore robes. Some would argue that since they both wore robes, we can both wear pants. That makes some sense at first glance. However, the point of Deuteronomy 22:5 was that there was a male-only robe that was distinct from a female-only robe. The woman would not put on the man's robe and the man would not put on the woman's robe. This did not relate to size differences or even fit (tightness or looseness), but some clear, public, designed distinctions that made them purposefully different. That has not occurred with pants. The point of pants was to remove the distinction. Our culture has not replaced the distinct female garment, the dress, with a new one, pants. Men wear pants. Now women wear pants. Some will say, "But women wear women's pants." But no distinctions have been designed in women's pants for the purposes of obeying God's requirement in Deuteronomy 22:5. We haven't said as a culture or as Christians, "Well, women's pants shall always have the zipper on the side." Or, "Women's pants must always be of a pastel color and men's pants must always be either dark brown, blue, or black." We have made no distinctions between the two. Sure, women will wear pants that are more feminine looking---in color, in embroidery, or unfortunately in tightness---but these are not designed distinctions. Women can and do wear pants the same color, material, embroidery, and sewing as men. Again, the point of pants on women was to remove the distinction. This attacked the image of God in men. This attacked God's design. That's why the person who does so is an abomination to God. It is a personal insult to God. This should be a serious issue to Christians. It should be about God and not about fitting in with the world. Is There Something Non-Cultural In the Argument? Gird up now thy loins like a man. God says that only men gird their loins. What is "girding your loins?" Men wore a robe. Only men girded their robe. Men had a belt, a girdle around their waist (in the loin area). When they would do manly activity, they would pull up the center of the robe and tuck it into their girdle so that they could function as a man. The loins are between the legs. Only men would pull a garment up to the loins. Pants permanently girded the male garment. The new expertise and skill and technology in sewing allowed for pants to be made, so that men could have their garments permanently girded. This way men could ride a horse, jump over barriers, and run much more easily. "Gird up your loins like a man" means nothing to us in Job if we don't understand what that practice meant. God said that this girding was a unique male activity or appearance. We should at least understand from this text that God wants these distinctions in appearance. How Should We Determine Our Position On Issues? When we take a position on an issue we start with interpretation of the appropriate passages. Then we investigate as to whether this is a historical position. Have Christians believed like this in the past? In other words, is it a private interpretation? It shouldn't be. If it is a non-historic position, great scriptural exegesis should overturn it. Then we make an application of the passage on the issue. What I have found with this issue of designed gender distinctions is that those who do not take the male pants and female dress position do not spend any time on exegesis themselves. They are not curious as to what the historical position is. All I've seen them do is take pot shots at those who take the same position as I do and usually ridicule. I would hope to see critics study the passages and history. I would expect them to interact with the multitude of commentaries that take the same position as I do. They don't. That should be tell-tale to anyone who is attempting to sort out his position. Pot shots and ridicule should not be respected as a way to deal with any issue. Who Would Make the Decision to Replace the Distinctions? When these cultural changes occur, it should be a big deal. It was when women started wearing pants. If there were distinctly female pants, who would decide that had occurred? The culture would. So has it? It hasn't. Why not? The culture isn't interested in distinctions. That was the point for allowing the distinction to disappear. What our culture has done in allowing this distinction to be removed is something unique in the history of mankind. Secularists believe that mankind has been here millions of years. We've actually been here around 6000 years. Men have believed in a creator or a designer. We have moved away from that belief as a culture. We have left the concept of a designer so it is no wonder that it doesn't matter if we reflect design any more in our culture. When Christians do not obey Deuteronomy 22:5, they are supporting this false idea that there is no design for humanity. Our culture isn't going to decide to replace old distinctions with new ones. For that reason, on this issue, Christians can't follow the culture. We must go back to the distinctions that were removed. Those were pants for men and dresses for women. God "cannot deny himself" (2 Timothy 2:13). "Let God be true, but every man a liar" (Romans 3:4). 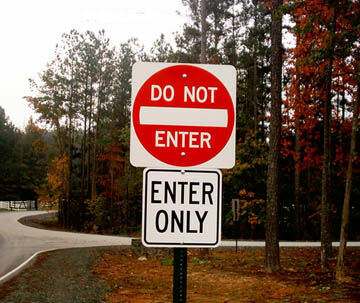 We should not expect contradictions. This is not the nature of God. Jesus said, "I am the truth" (John 14:6). There isn't more than one truth. From this perfect unity of God's attributes and revelation of Himself and His will through Scripture, we expect the same lack of contradiction in our own doctrine and practice. Recently, however, two such contradictions have caught my attention. I wrote about a first in part one, entitled: "Contradiction Number One: The Eruption over the Fundamental Baptist Fellowship Sermon." The concept of a total apostasy is foundational to most cults. They must prove that the doctrine and practice of the first century early church has been forsaken for an erroneous replacement. For instance, the Jehovah's Witnesses must believe that the pure, original teaching of the Person of Christ had been lost to the conspiratorial Trinitarians. The Campbellites must accept that the pure, original teaching of salvation had been lost to the novel salvation-by-grace-through-faith alone view. The Mormons, to make room for their theological system, must show how that the right interpretation of scripture had actually been lost. Jude 1:3 also rejects a total apostasy. The key portion on this is "the faith which was once delivered unto the saints." "Once" comes from the Greek hapax, which means, "once for all time." It is a strong statement about the teachings of God's Word. They were delivered to the saints once and for all time. "Delivered" is aorist, speaking of completed action. The deliverance of the faith was complete. We don't need to be concerned that we had not yet been given doctrine that God still planned for us to receive. From this verse we believe that no doctrine would be lost. A scriptural pneumatology, the doctrine of the Holy Spirit, precludes the possibility of a total apostasy in the age in which we live. Jesus made promises that ensure that every Christian can count on having all of the teachings from God's Word. John 16:13---Howbeit when he, the Spirit of truth, is come, he will guide you into all truth: for he shall not speak of himself; but whatsoever he shall hear, that shall he speak: and he will shew you things to come. 1 John 2:27---But the anointing which ye have received of him abideth in you, and ye need not that any man teach you: but as the same anointing teacheth you of all things, and is truth, and is no lie, and even as it hath taught you, ye shall abide in him. In John 16:13, we see that the Holy Spirit "will guide [us] into all truth" and in 1 John 2:27 that the Holy Spirit "teaches [us] of all things" and "is no lie." Biblical Christianity will last and every doctrine will survive in its midst. The "falling away" (apostasy) and the "son of perdition" being revealed occur at the same time period. Also the Holy Spirit, the restrainer (the one who "lets" or "restrains"), will be taken away. Until this occurs, there will be no total apostasy. All doctrines will remain intact. So What Happened to the True Doctrine of the Preservation of Scripture? Most evangelicals today say that the true doctrine of the preservation of Scripture is that God chose not to preserve the words of the original manuscripts. He preserved the doctrines of scripture, but we do not possess a perfect copy of God's Word any more. Enough mistakes were made in copying that we do not know what the words of the original are anymore. They contend that this is the orthodox doctrine. Those who do believe in perfect preservation they will attack as heterodox and heretical. If what these evangelicals propose, which includes many fundamentalists, were actually true, then we should find their doctrine from 1500 to 1800 among orthodox, evangelical Christianity, that is, the ones who possessed the Holy Spirit. However, when we read the doctrine of reformation era and post-reformation era saints, we don't see this supposedly orthodox doctrine of the "preservation of all the doctrines but not the words." They didn't believe that. They believed that they had available to them all of the words of Scripture. You find this in the Westminster Confession (WC) and the London Baptist Confession and the Formula Consensus Helvetica. You will find this bibliology of modern evangelicalism and fundamentalism nowhere during that time period. When we can't find a particular doctrine in history, we should look to see if we can determine when it arose. This is actually simple. Evangelicals didn't start holding this view until Benjamin Warfield of Princeton Seminary came along to read this view into the WC in the late 19th century. No one else had read this doctrine in the WC until that point. Many evangelicals and then fundamentalists (once the fundamentalist movement began in the early 20th century) latched ahold of this new Warfield doctrine. Today you can read fundamentalist materials written that attempt to formulate a history to their new doctrine. As you read their books and articles, you see that they trace the teaching no further than the late 19th century. And then they claim this as a historic position. You read this in God's Word in Our Hands: The Bible Preserved for Us and in God's Word Preserved and God's Word Preserved: A Defense of Historic Separatist Definitions and Beliefs. Notice how Sproul says, "Historic," in his title. I believe that we would need to give a new definition to "historic" if "historic" refers to a doctrine that one can trace back a little over one hundred years. That is just the opposite of a genuine understanding of "historic." Neither of the above mentioned books does anything to show why the history of 1500-1800 could not be true. They don't show why we shouldn't believe what Christians believed in that time period. Both Sproul and the authors of the other book just make an assertion that they have a history, one that cannot be proven for them. They either don't think it important to deal with historic doctrine or they're ignorant of it. If their doctrine on preservation is true, then there was a total apostasy from 1500 to 1800 at least. They need to explain that. Not only haven't they, but no one has. That should make their doctrine completely suspect as the actual new doctrine, the new heterodox doctrine of preservation. When you read the materials by mainly fundamentalist authors in their multiple volumes attacking the historic doctrine of preservation and the King James Version of the Bible, what you will see is that they mainly resort to ad hominem attacks, including slanderous smears of those who hold to the scriptural and historical position. This is a major part of their strategy to make their position acceptable. They attempt to discredit those who take the historical orthodox belief. They often point out how that they are the ones that are being slandered and misrepresented, and yet, this very activity is a major technique they utilize to buttress their own position. True believers should expect more than this theological contradiction of those who claim orthodoxy. They ought to be able to produce some history. If they can't, then they should admit that they're holding to a new position. To do otherwise is dishonest and manipulative. A new doctrine should not arise without scriptural and historical support. If I had this kind of charge brought against me, that is, that I am believing a brand new doctrine without historical basis, and that by doing so, I am holding to the total apostasy of a particular doctrine, I would take it very seriously. I would go to the one(s) making the charge and give them my answer. I wouldn't stand for it. I would want to show that it wasn't true. I would expect to see that reaction from men, evangelical and fundamentalist, who claim to hold the truth.